The OCIPLA, in collaboration with co-sponsors LAIPLA and USC, is proud to present this special event. 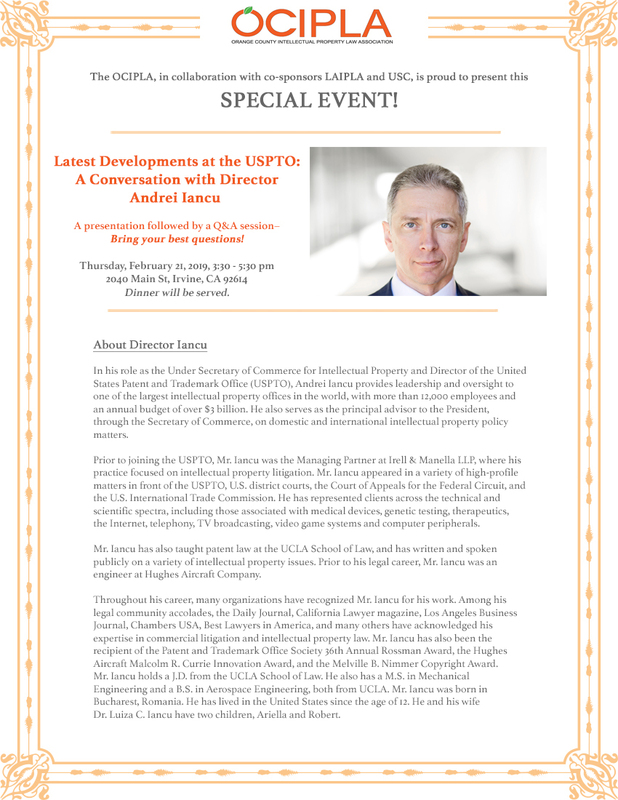 Join us for a conversation with USPTO Director Andrei Iancu — a presentation will be followed by a Q&A session; bring your best questions! Dinner will be served. View / download a shareable flyer. In his role as the Under Secretary of Commerce for Intellectual Property and Director of the United States Patent and Trademark Office (USPTO), Andrei Iancu provides leadership and oversight to one of the largest intellectual property offices in the world, with more than 12,000 employees and an annual budget of over $3 billion. He also serves as the principal advisor to the President, through the Secretary of Commerce, on domestic and international intellectual property policy matters. Prior to joining the USPTO, Mr. Iancu was the Managing Partner at Irell & Manella LLP, where his practice focused on intellectual property litigation. 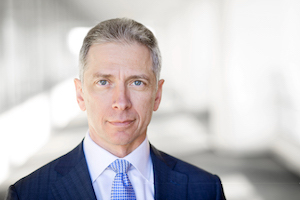 Mr. Iancu appeared in a variety of high-profile matters in front of the USPTO, U.S. district courts, the Court of Appeals for the Federal Circuit, and the U.S. International Trade Commission. He has represented clients across the technical and scientific spectra, including those associated with medical devices, genetic testing, therapeutics, the Internet, telephony, TV broadcasting, video game systems and computer peripherals. Mr. Iancu has also taught patent law at the UCLA School of Law, and has written and spoken publicly on a variety of intellectual property issues. Prior to his legal career, Mr. Iancu was an engineer at Hughes Aircraft Company. Throughout his career, many organizations have recognized Mr. Iancu for his work. Among his legal community accolades, the Daily Journal, California Lawyer magazine, Los Angeles Business Journal, Chambers USA, Best Lawyers in America, and many others have acknowledged his expertise in commercial litigation and intellectual property law. Mr. Iancu has also been the recipient of the Patent and Trademark Office Society 36th Annual Rossman Award, the Hughes Aircraft Malcolm R. Currie Innovation Award, and the Melville B. Nimmer Copyright Award. Mr. Iancu holds a J.D. from the UCLA School of Law. He also has a M.S. in Mechanical Engineering and a B.S. in Aerospace Engineering, both from UCLA. Mr. Iancu was born in Bucharest, Romania. He has lived in the United States since the age of 12. He and his wife Dr. Luiza C. Iancu have two children, Ariella and Robert.